Why create/publish this page? VBA is an ancient technology. I mean over 25 years old. That doesn’t make it bad. In fact, it’s still the ONLY environment a developer can use to create a cross-compatible, PC & Mac, Office application add-in that is tightly integrated with the application’s Object Model. This is a summary list of things I’ve discovered while developing a cross-compatible VBA application add-in for the Windows and Mac versions of PowerPoint 2016. It’s not intended to be 100% comprehensive and I will add any new findings to the list as and when I come across them. Thanks to PowerPoint MVP Steve Rindsberg of PPTools for helping me validate and report some of these issues. If you find something incorrect or want to add something, please contact us. For further Mac VBA tips, Ron de Bruin’s Excel:mac pages are excellent. The VBE Options dialog, General tab, cannot be used to set Error Trapping to Break on all Unhandled Errors. The solution is to edit a plist file as described here.This bug has been reported to and confirmed by Microsoft and provided as a community answer here. Selection.HasChildShapeRange always returns False even if there are children selected within a group of objects. Guides collection not available for Presentation, CustomLayout or SlideMaster objects. ShapeRange.MergeShapes method not available. Solution is to use CommandBars.ExecuteMso “ShapesCombine” or “ShapesFragment” or “ShapesIntersect” or “ShapesSubtract” or “ShapesUnion”. Userforms cannot be created, viewed in design mode or edited. They must be designed on PC and then tested on Mac. The code module associated with a userform can be viewed and edited on Mac. MouseIcon and custom MousePointer properties are not supported. When setting a custom .ico or .cur image on a userform control, PowerPoint Mac will be unable to run any code and will raise the extremely useful error “Microsoft Visual Basic” followed by a second one when attempting to use the Show method “Unexpected error (485)“. Form Size : because of the 72/96 DPI difference between monitor resolutions, unmodified forms will appear smaller on a Mac. Use the code in theses references as a workaround [Ref 1] [Ref 2]. cmd+v pastes the character v into text boxes instead of the content of the clipboard. A workaround using automatic clipboard pasting is available here. Path separators may use : or / instead of the \ used in Windows. GetShowLabel callback is broken. It only fires when the ribbon is initially loaded and not when the Invalidate method is called. This bug has been reported to and confirmed by Microsoft. LoadPicture doesn’t work to dynamically load a picture into a form control at runtime and there appears to be no equivalent workaround used on Windows (using APIs) to do this on Mac. Office:mac 2016 runs in a special secure sandbox. This causes all sorts of development and user challenges when trying to do things that were once easy. For example, if you want to open a file on Office:mac 2011 you could use MacScript. But now that doesn’t work and AppleScriptTask requires the script file with the command to already exist within the sandboxed area of the Mac file system. Obviously Windows APIs don’t exist on the Mac. The next best thing when you can’t find a way to do something in native VBA is to use AppleScript. 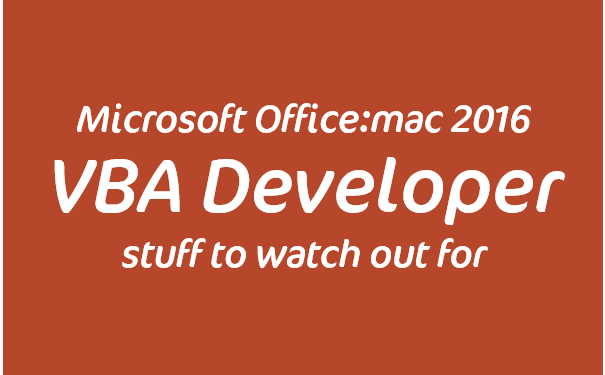 Office:mac 2011 used MacScript but this doesn’t work on Office:mac 2016 when accessing the file system due to the sandbox environment. To access the files system the new AppleScriptTask function is used but it has to run a pre-existing .scpt file on the machine rather than a run-time build string. Use the Mac or MAC_OFFICE_VERSION conditional compilation constants in #If…#Then…#ElseIf.. directives. Debug.Print "Not Mac" ' This line runs on both PC and Mac! Using empty strings (“”) as the Default parameter in the GetSetting function will raise an error on Mac. Responding to events such a selection change or a new presentation being opened is essential if you want to keep the state of the ribbon up to date. None of the “proper” application-level events are available on Mac but you can use some of the legacy pseudo-events as described in our application events article. If you’re creating a VBA add-in (.ppam) then you can wrap this up in either an EXE, MSI or VBS installer. There is no equivalent on a Mac and the installation must be made manually, on each individual machine, using the PowerPoint / Tools UI. Digital Signatures are not supported for macro-enabled project files on Mac. vbCrLf constant behaves differently. On a PC it inserts a single return, on Mac it inserts two.